I have settled in St Petersburg, Florida and maintain a studio at the Morean Center for Clay, the foremost clay center in the southeast. New work continues to be made, occasionally clay houses, sculptural ancient vessels, delicate paper clay porcelain Fragmenti bowls and other pieces as my interests take me. 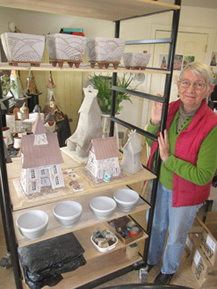 Any Windy Meadows Pottery house will have a unique combination of clay and glaze and will differ from earlier work. The clay used, the glazes and the kiln firing methods are different from the original pieces as the earlier materials and equipment are no longer available. This increases the value of the earlier pieces. Please do sign up for our email list as that will be best way for me to keep in touch with everyone. Paper mailings will be greatly reduced. 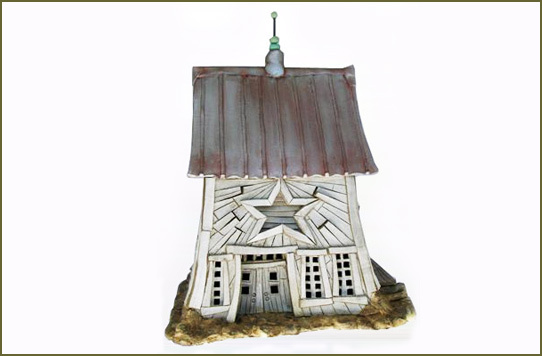 Windy Meadows Pottery's cottages and candlehouses are all "hand-built" using NO MOLDS! The fine details and textures, my personally designed and developed colored stone ware and porcelain clay color accents that have become my trademark, are applied individually and can include customized wall colors, roof textures, and signage. The private collection pieces are so elaborate that some designs take up to 4 days to build. Individual construction, a second firing, and occasionally hand-painted details insure that each cottage is unique with character and personality.